Real are another British brand that have gone for a modern and well presented case for inclusion in shopping baskets. 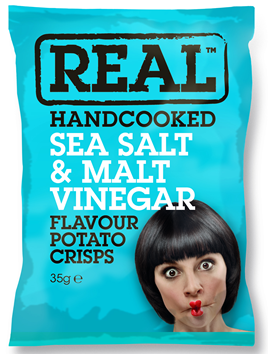 If Walkers did not have a virtual monopoly with Britain's main supermarket chains, the likes of Real would be far more prevalent. The branding is large and readily identifiable a the top. The flavour is similarly large and striking. Each bag is flavour colour coded and they all include a mascot style face to represent each flavour. These were thickly cut Crisps. They also featured see through areas, which would indicate well soaked in oil. There were also accompanying oil blisters. The overall look was pale and glassy. There was skin on some edges and most were irregularly shaped, as is usually found with batch cooked Crisps. A Nose Plunge Test revealed a tart Vinegar aroma, which left us a little mystified when the eating process began. The secret of a great Salt & Vinegar combo is undoubtedly balance - unfortunately, while there was balance present it was all rather muted. The Salt was barely noticeable and the slightly more dominant Vinegar was not really close at all to the smell. The outcome was a Crisp that left most welcome imagery of Fish 'n' Chips at the seaside, but not a particularly stand-out Crisps flavour.